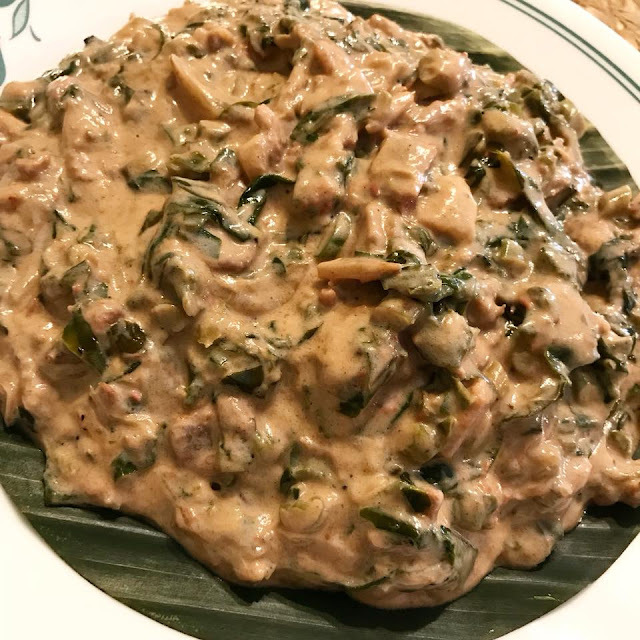 Laing is a spicy Bicolano dish that is made of dried taro leaves, shrimp paste, chili peppers , coconut milk and more. This Laing recipe is creamy, delicious, perfect as a side dish and worth trying. 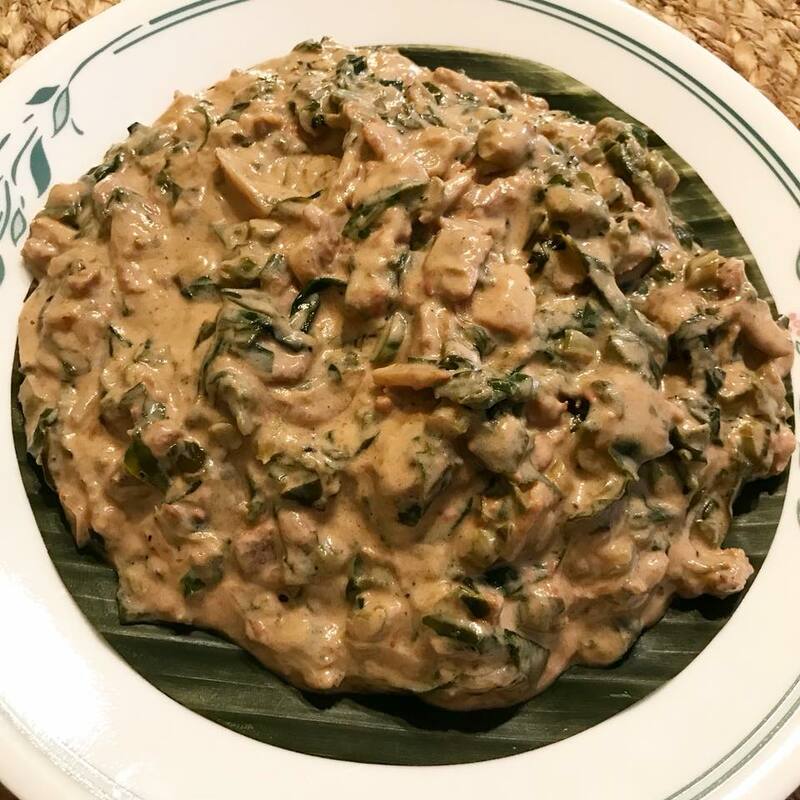 I have been wanting to cook Laing for the longest time so when I saw some fresh taro leaves from my local Asian store I did not think twice and purchased a couple of bags. The recipe calls for dried taro leaves so when I got home I rinsed it in running water, towel dried and dried under the sun for few hours. It did not turned out that dry as I expected but it worked and it turned out really good. Some do cook Laing with shrimp or dried fish but this recipe I used pork belly and shrimp paste. There are many ways on how to cook Laing and here is an easier version. They say you can get some itchy sensation in the mouth if the taro leaves is not cooked right so to avoid that, do not stir the leaves until it is almost fully cooked. Heat wide pan and add cooking oil. Add pork and cook until pork turns light brown. Add garlic, onion and ginger. Saute for few minutes. Add chili peppers, stir and continue cooking for few minutes. Add shrimp paste and saute. Cook for few minutes. Add taro leaves and let it sit for minutes until it starts to wilt. Do not stir. Pour in coconut milk and bring to a quick boil. Do not stir. Once it starts to boil reduce to low heat. Cover and simmer for 10-15 minutes or until the taro leaves is almost fully cooked. Season with fish sauce and ground black pepper. Stir well and cover pan. Simmer for 30 to 45 minutes or more until the taro leaves turns soft and sauce is creamy. Taste test if more salt is needed. Remember to stir every few minutes to avoid the laing from sticking to the bottom of the pan. Transfer in a serving dish and serve with lots of steam rice. Enjoy.